A dispute between the EU and China over telecoms exports could chill a vital trading relationship. Europe is getting tough with China over trade. The European Union said Wednesday that it had enough evidence to begin an investigation into Chinese telecoms network suppliers over unfair subsidies and dumping products below market prices. The EU's top trade official said he hoped China would be willing to negotiate to prevent the formal opening of a case, which could lead to punitive import duties being imposed. "This decision will not be activated for the time being to allow for negotiations towards an amicable solution with the Chinese authorities," EU trade commissioner Karel de Gucht said in a statement. 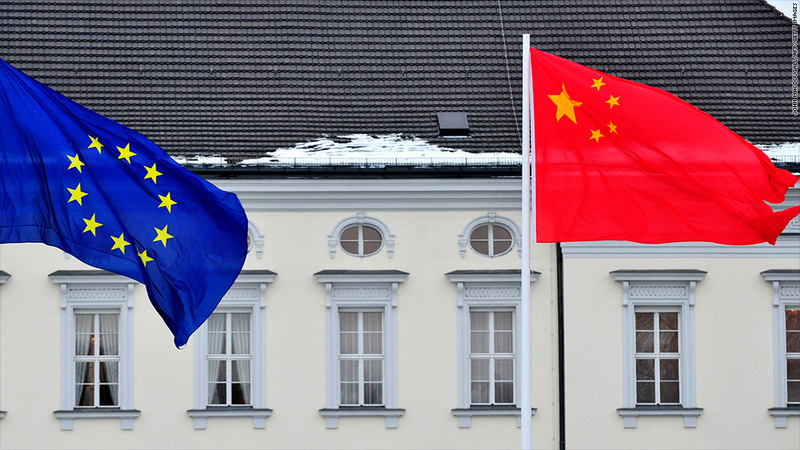 China exports telecoms network equipment worth about one billion euros each year to the EU. De Gucht did not mention any companies by name, but big Chinese players in the European market include Huawei and ZTE (ZTCOF). Huawei said in a statement that it was "disappointed" by the EU warning. "Huawei always plays fair and we win business and trust from our customers through our innovative technology and quality service, rather than via pricing or subsidies," the company said. EU action against unfair trade practices usually begins with an official complaint by companies active in the industry. But in this case, the European Commission is opting to pursue action without waiting for a complaint from firms such as Ericsson (ERIC)or Alcatel Lucent (ALALF). "This possibility is particularly important as it offers a shield when the risk of retaliation against European companies asking for trade defense instruments is high," the commission said in a statement. Ericsson, the world's largest maker of mobile networks, said it did not support the EU action. "Ericsson is a strong supporter of free trade and we don't believe in this type of unilateral measure," said Ulf Pehrsson, the Stockholm-based company's head of government and industry relations. "Our policy is for open, free and unrestricted trade and global supply chains, benefiting users and societies." Much is at stake if trade relations deteriorate between the world's second-biggest economy and Europe, which is looking to exports to help end a prolonged recession. China is the EU's second biggest trading partner behind the United States, and the EU is China's biggest market. Trade in goods and services between the two totaled nearly 480 billion euros last year. The biggest outstanding trade dispute concerns Chinese exports of solar panels, cells and wafers worth 21 billion euros per year. The EU launched an anti-dumping case last September after more than 20 local producers filed a formal complaint. The European Commission will impose provisional duties on those imports at an average rate of 47% as early as next month, according to recent reports. A commission spokesman could not be reached for comment. The U.S. Commerce Department imposed tariffs on Chinese-made solar panels last year after it found manufacturers were dumping their products on the American market.